I’ve written before that it can be helpful to picture your rpg as a game board. Everything you or your players do has the potential to move a piece, add one to the board, or remove it from play. But what do those pieces do? I like to think of it this way. 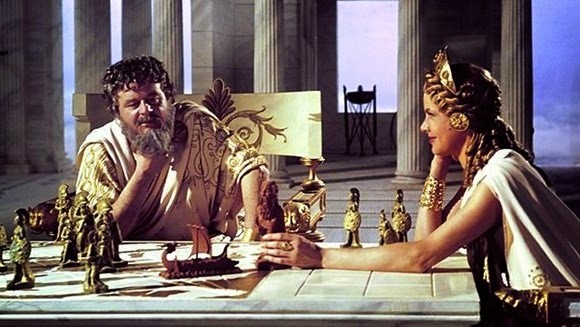 In Jason and the Argonauts, Zeus and Hera are playing a chess game where every move impacts earthly events. The board is a map of the Mediterranean. The pieces are monsters and other beings, which apparently follow rules of movement and attack. 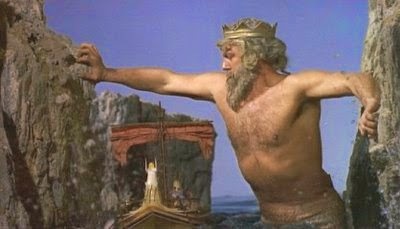 The rules are never defined for us, but they’re there: in one scene, Hera has only one available move – Zeus‘ strategy has boxed her in. 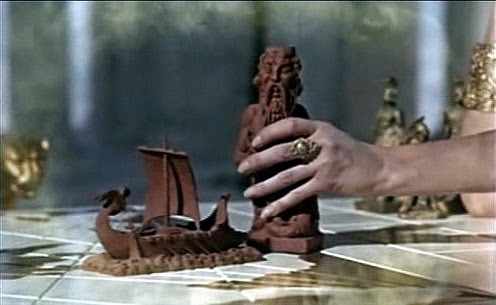 The gods probably know the full rules for this game – but explaining what each and every piece can and cannot do would be boring. Some of the pieces don’t even come into play – and those that do usually only move once. The audience doesn’t care about the full rulebook-defined range of what each piece could do – they only care about what each piece does do, in this story, and how that affects the main characters. This is a helpful picture of how ad lib works. The game board is your gameworld – at least, the part of it that the PCs are interacting with. The pieces are all the in-game parties that impact your story: NPCs, monsters, locations, items, ongoing conditions, etc. The PCs are a special kind of piece that only the players can move. The players can move some of the other pieces, depending on the skills their PCs have. And the GM moves all the other pieces at will. When is a player moving a piece? One more thing: I said above that players can use their PCs’ skills to move and affect other pieces. Well, they can also move pieces just because of their status as human players. The players decide to snoop around the docks instead of downtown like you’d planned. If you hadn’t put docks in your notes, they just created some. You place an “impassible” chasm on the board, but they find a reasonable way across it. They just changed a dead end to a skill challenge. A player says that he climbs into the rafters even though you haven’t established whether the room has rafters or not. It does now – as long as that doesn’t throw your story too off track. Now, players won’t always know that they’re adding/moving/changing pieces (because they didn’t read this article!). But, unconsciously, that’s what they’re doing. And if you think of it that way, you can let them have their creativity without feeling like you’ve lost control. A) What are the players trying to do with it? B) Would you expect this thing to work that way based on the genre you’re playing in? C) Is this what the story needs? Your players will often use a given “piece” in a way that will surprise you – forcing you to stretch your preconceptions of what you thought it could do. Since you’re not Zeus, you’re finding out more things each piece can do, in real time! And you can tell whether their moves are legit or not based on whether what they want to do feels right for the story. In this way, you’ll find that the rules of the pieces can be quite definite – even though they’re undefined. This is why openmindedness and story-wisdom are pretty much the ultimate tools for being a good GM (or player).